A reminder that all library branches including Rare Books and Special Collections, the Chung Collection and University Archives are closed on Monday September 5 for Labour Day. 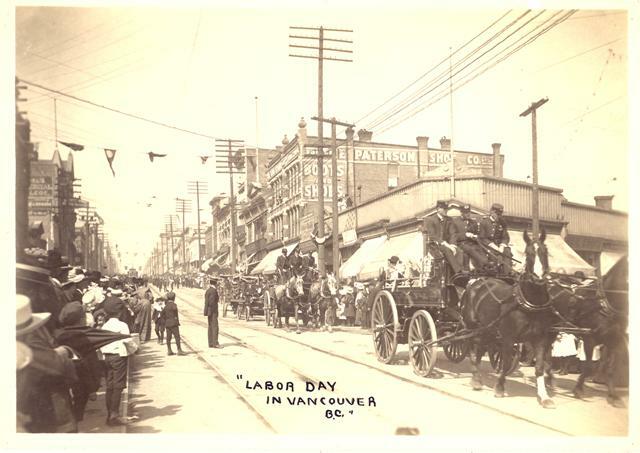 The photograph above depicts a Labour Day parade in Vancouver, taken by Philip Timms in the early 20th century. 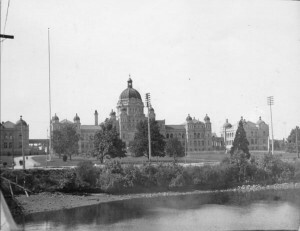 The photograph is undated, but is believed to have been taken at the corner of Hastings and Cambie. 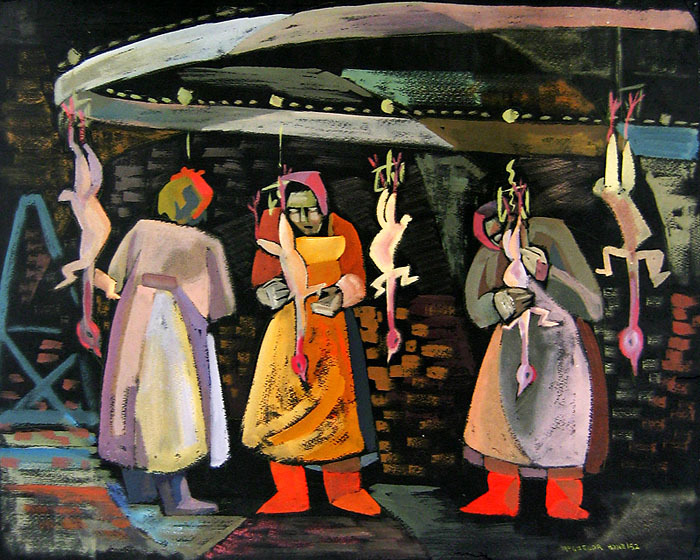 RBSC has extensive holdings on the history of labour in British Columbia; try searching the library catalogue for the keyword “labour,” and limit your search to “Archival/mixed collections” (under “type”). 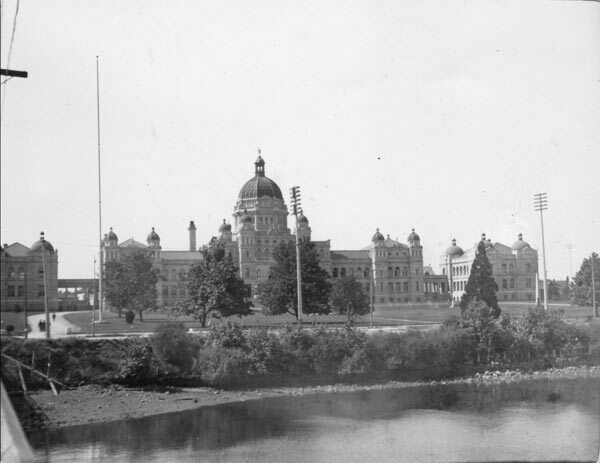 For more information on our historical photograph collections, please consult our Historical Photograph Research Guide, and for help with archival research, please consult our Archival Material Research Guide. The Chung Collection Exhibition will be closed to the public from August 24-26 and August 29. We apologize for the inconvenience. Summer is, believe it or not, coming to a close in 6 short weeks. Have you been to the beach yet? 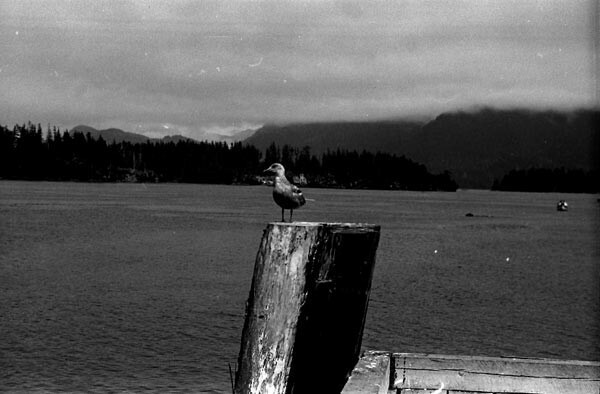 For many in B.C., a trip to Tofino is synonymous with a trip to the beach. Located on the west coast of Vancouver Island, Tofino is the home of the world-famous Pacific Rim National Park and beautiful Long Beach. Major industries have traditionally included fishing and forestry, and in recent decades of course tourism, as visitors flock to the resorts and beaches in all seasons. The photographs below are from the Chung Collection, held in Rare Books and Special Collections. 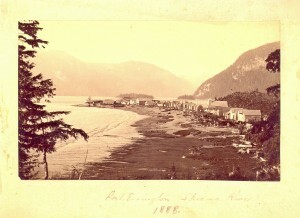 The Chung Collection holds 8,000 historic photographs, many showing various locales in British Columbia. These photographs are both from an album of photographic negatives, taken during the 1930’s by an unknown photographer. While we do not know anything about the photographer or the origin of the photographs, it is a rich source of historic photographs. This album alone contains more than 1,400 photographs! 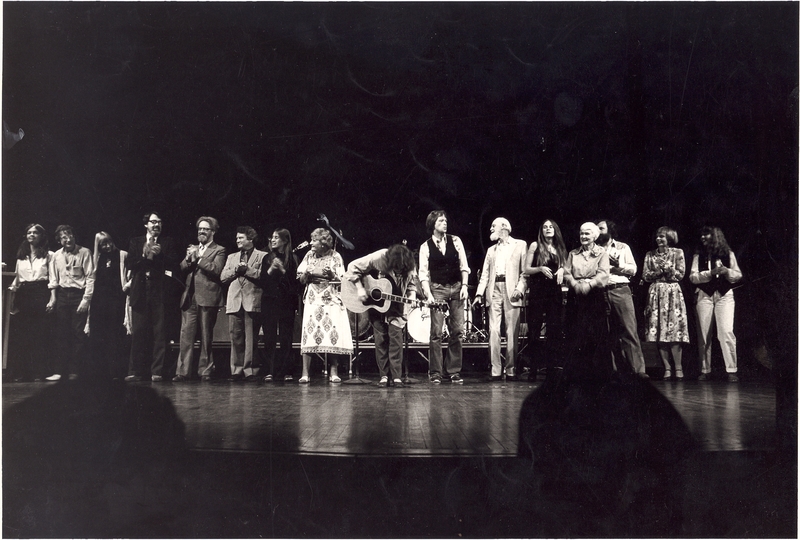 They can all be found in the Chung Collection by searching for the identifier CC-PH-09370. 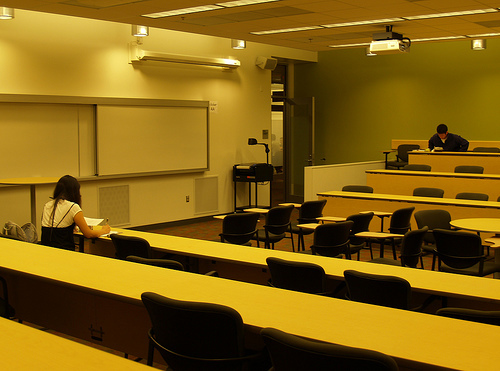 In the Irving K. Barber Learning Centre, the Tofino Meeting Room is number 156. The Skeena River Room, room 317 in the Irving K Barber Learning Centre, is a group study room that is named after the Skeena River, the second-longest river entirely within British Columbia’s borders (the largest being the Fraser River). Six-hundred and twenty-one kilometers long, it flows south and west through the Skeena and Coast Mountains, reaching the Pacific Ocean at Prince Rupert. For thousands of years, the Tsimshian (“People of the Skeena”) have lived along the river; the Coastal Tsimshian live near the lower part of the river and the Gitksan live on the upper part of the Skeena River. 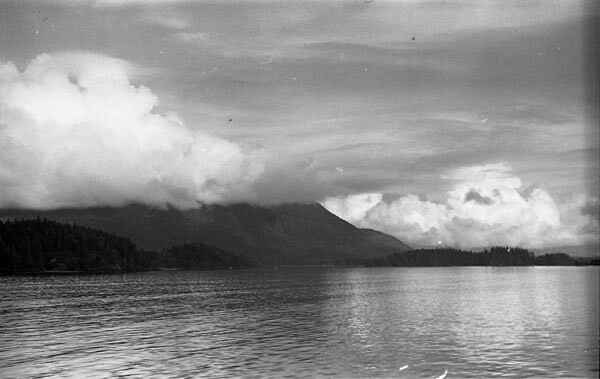 George Vancouver visited the mouth of the Skeena River in July, 1793, but it wasn’t until the 1860s and 1870s that persons associated with the Gold Rush and railway began to travel to and settle along the river. In 1876, salmon canneries were built along the Skeena River. Operating along the river from the late 1870s to the mid-1980s, at one time there were as many as 18 canneries along the Skeena. 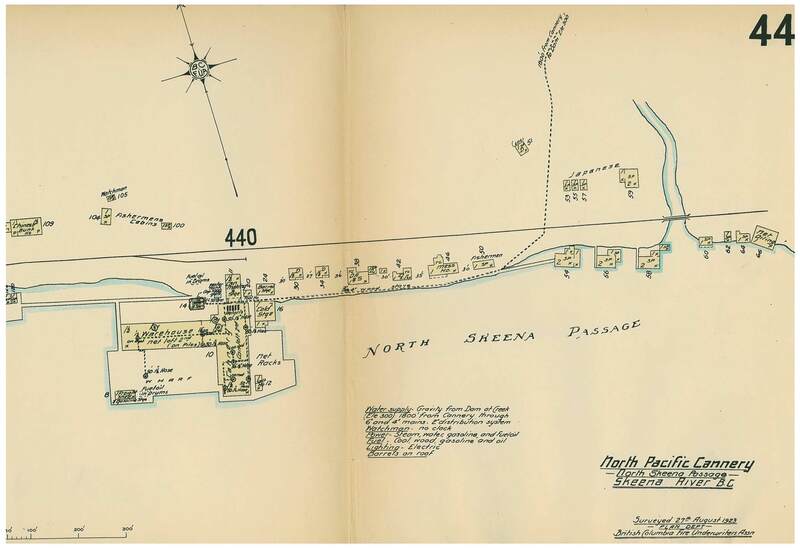 In Rare Books and Special Collections, we have various records and plans of salmon canneries that operated in British Columbia, and in particular along the Skeena River. 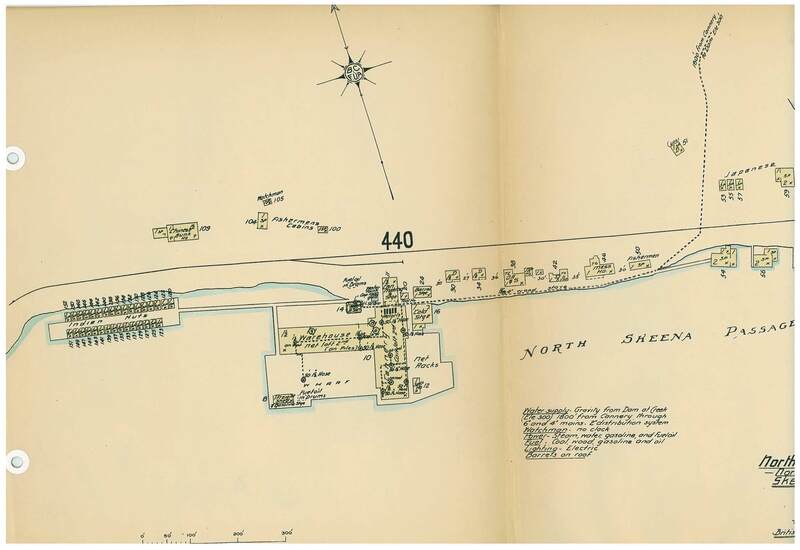 For example, in the Inverness Cannery fonds, there are plans, financial records and correspondence relating to this cannery constructed along the Skeena River in 1873. The J.H Todd and Sons fonds also contains records concerning the Inverness Cannery. 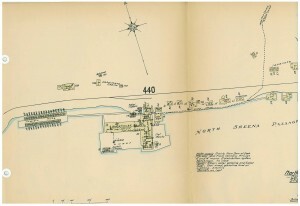 It is also very interesting to consult the 1924 fire insurance plans of Skeena River salmon canneries in the collection of Plans of salmon canneries in British Columbia together with inspection reports on each, that are part of the records of the British Columbia Fire Underwriters’ Association. 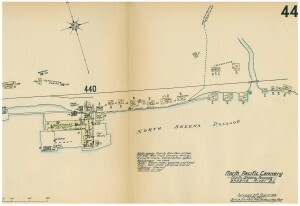 This collection includes the plans of 12 canneries that operated along the Skeena in the early 1920s: Inverness Cannery, North Pacific Cannery, Dominion Cannery, Sunnyside Cannery, Cassiar Cannery, Haysport Cannery, Alexandra Cannery, Balmoral Cannery, Port Essington Cannery, Carlisle Cannery, Claxton Cannery, and the Oceanic Cannery. Fire insurance plans are detailed large-scale maps of cities, smaller municipalities, and industrial sites that were produced from the late 1800s to the mid-1960s. The object of these maps was to show the character of any insured building. These plans were compiled by the fire insurance underwriters to assist their agents in assessing and controlling the risks of fire. Various symbols and colours were used to indicate the following characteristics: the shape and size of a building; the type of construction used; the existence of fire protection facilities; and the use of the building (e.g., a restaurant, a laundry, etc.). This week, we are taking a closer look at the community of Hartley Bay — the community that the Hartley Bay Meeting Room (room 266), in the Irving K Barber Learning Centre is named after. 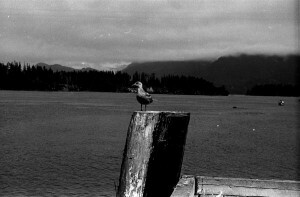 Hartley Bay is the home of the Gitga’at First Nation, members of the Tsimshian cultural group. A village of 200, accessible only by air or water, Hartley Bay is located at the mouth of Douglas Channel, about 630 kilometres north of Vancouver and 145 kilometres south of Prince Rupert. On March 22, 2006, the people of Hartley Bay were the first responders to the passengers aboard the sinking BC Ferries Queen of the North. The community was recognized for their heroic actions by the Governor General on May 3, 2006 and received the Governor General’s Commendation for Outstanding Service. The XWI7XWA LIBRARY, located at 1985 West Mall has a variety of material on the community of Hartley Bay, including material in their special collections. Contact Ann Doyle, head of XWI7XWA LIBRARY, for more information on accessing material in the special collections. 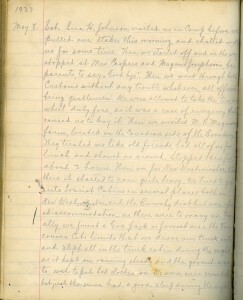 A new archival collection is now available at Rare Books and Special Collections: the Stefan Arnason fonds contains the diaries of an Icelandic immigrant who, like a Canadian version of Grapes of Wrath, packed up his family of thirteen in 1937 in a 1.5 ton Dodge truck and moved them from Pine Valley, Manitoba to Vancouver. 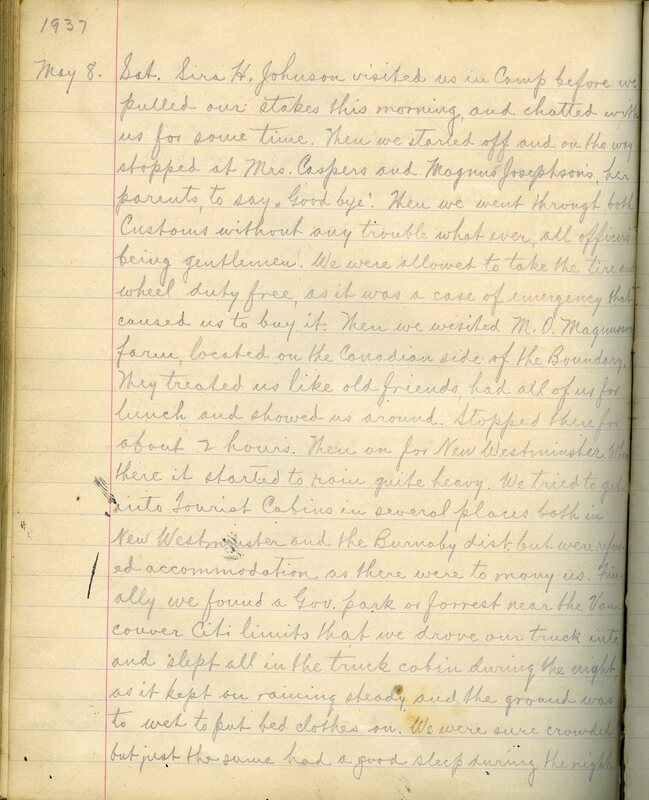 The diary excerpt shown here describes their arrival in the Vancouver area- unable to find accommodations able to house such a large family, their first “home” in Vancouver was camping out in Central Park in Burnaby, which he initially described as a “forest near the Vancouver city limits.” The diaries continue from there to chronicle the family’s every-day life in Vancouver, including employment issues, family occasions, and even the weather. Stefan Arnason was an active diarist until his death in 1956. The diaries and their transcriptions, as well as other notebooks and documents, have been made available for use here at RBSC through their generous donation by the descendants of Stefan Arnason. Most of the material is in English; some earlier diary entries are in Icelandic, but translations are available in the transcriptions.